Satisfy your baby’s growing curiosity about the world with big, brainy science for the littlest listeners. 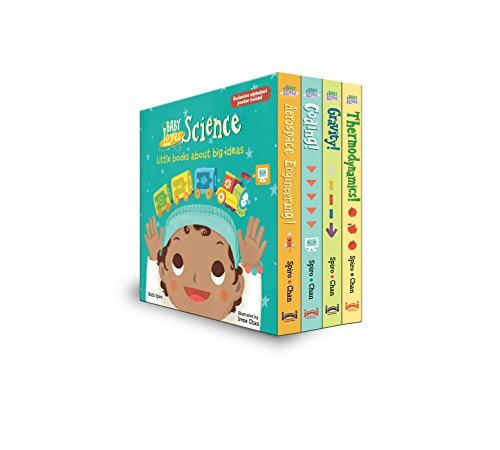 Accurate enough to be endorsed by an expert, yet simple enough for baby, this clever board book boxed set, complete with an adorable periodic table poster of the alphabet, introduces topics like coding, aerospace engineering, gravity, and thermodynamics, connecting each scientific idea to pieces of a baby’s world. Beautiful, visually stimulating illustrations and age-appropriate language encourage baby’s sense of wonder. Parents and caregivers may learn a thing or two, as well! Includes four Baby Loves Science board books and an adorable periodic table poster of the alphabet.